rain rain go away | a georgia peach growing on the rain coast? Looking through the archives here (since I haven’t kept up so well in the last two years or more), I realize how much has changed since I first became interested in the movement for seasonal, local real food. Aside from from some dabblings in container gardening on my porch in Atlanta (where a nuisance mulberry tree changed my mind about scavenging food), I started growing food in earnest in 2007. (See here for my thoughts on organic vs. local food as well as a description of my first season of gardening.) I’ve moved twice since then, so I know how much work goes into creating a garden and what a shame it is to have to do it all over again when you move to a new place. But, I also know that moving presents an opportunity for gardeners to get things right from the start with every new property. When I moved from my 2007 residence, it was in the month of May–a fine time to start a new garden, but it was a pain in the neck moving with all my seed starts. And, then there was the garlic I had to leave behind… The previous fall, I had dug up two patches of lawn to install raised bed frames that were given to me. I filled them with compost and lots of grass clippings from a neighbor’s lawn trimmings bin and replaced the topsoil. I then planted garlic and put the beds to sleep under a layer of leaves for the winter. The garlic greens were several inches high when we moved. Not only did I not get to harvest my first garlic crop (hopefully someone else did and it didn’t go to waste), but I also never got to see how those beds performed. Maybe they were full of weed seeds from the grass clippings… something I didn’t consider at the time and, fortunately, could avoid when starting future gardens. We didn’t know how long we’d be in the next house, but I wanted perennials and I had the landlords’ permission to do whatever I wanted with the yard (or so they said when we moved in). Again, I set about creating new beds and added rhubarb, raspberries, and a tayberry plant to the existing landscaping. 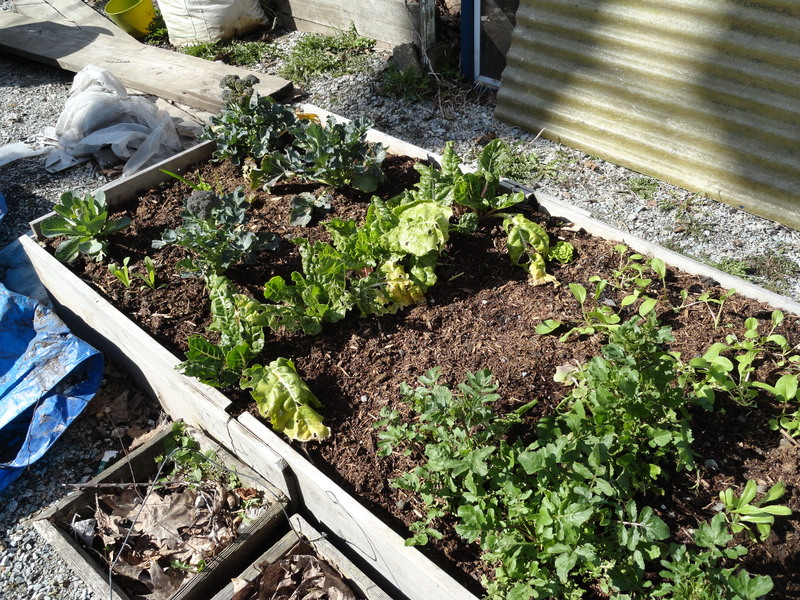 It wasn’t until after the back-breaking labor was done that I discovered the easy way of creating new garden beds–sheet mulching (also called “lasagna” gardening, or simply “no-dig” gardening). I started this post over 7 years ago, back when it seemed I would always be a low-income renter in a city whose housing market wouldn’t stand still long enough for me to catch a break, let alone catch up. Here I am, two-and-a-half years a homeowner (but I had to move back to the Southeastern United States to do it) with gardens I will choose to leave one day on my own terms, not those of landlords and real estate developers… I do still have a soft spot in my heart for the plight of short-term gardeners, those whose desire to root down and grow food is perennially thwarted by the need to move house and move on. Any garden is a commitment to and a hope for the future, especially the establishment of low-maintenance, long-bearing perennial food crops. Frequently moving would seem to impede the aspiring gardener. Who would invest so much time and effort into creating garden beds and building soils they can’t easily move? Who would plant fruit trees and bushes just to leave them behind? I propose we rethink our connection to land and plants as temporary stewards instead of owners. I propose that we think of our contributions to whatever land we temporarily inhabit (by building gardens and establishing food-producing plants) as “paying it forward” to future tenants of that space. Even now that I live in a home I own, the asparagus, cherry and blueberry bushes, and fruit trees that I plant are not mine forever. I will sell them with the house, hopefully to someone who appreciates their maturity and productivity as adding value to the property. As a renter, I contributed my fair share of productive perennials to properties I didn’t own; I hope whoever inhabited them after me appreciated them. If everyone had this “pay it forward” attitude about transient gardening, it wouldn’t feel so bad leaving plants behind because you could look forward to inheriting new plants to steward in your new digs. You’d say ‘goodbye’ to an apple tree and a gooseberry and ‘hello!’ to a pear tree and a kiwi! How would owners feel about this? I contend that established gardens would add value to a property, especially as a rental, since renters don’t usually expect to be able to garden. 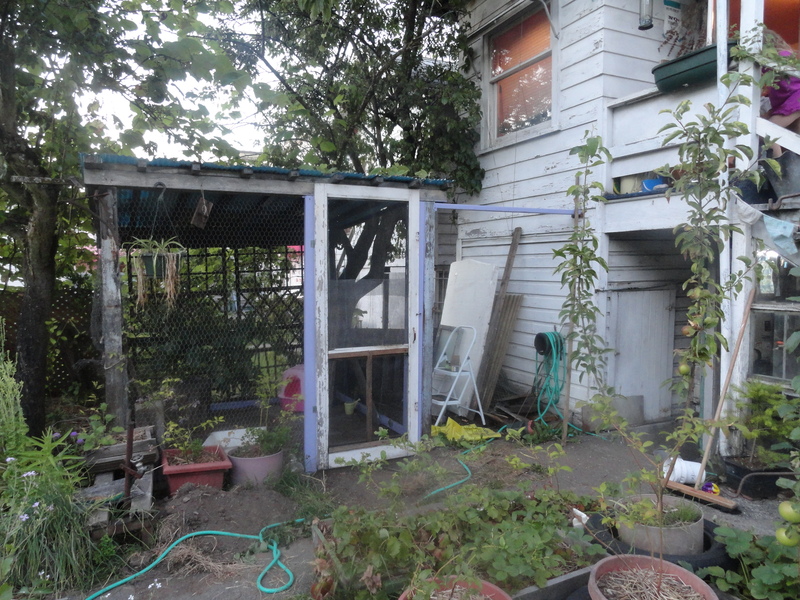 Going back to the original post, written after moving to a new residence where I had the “landlords’ permission to do whatever I wanted with the yard (or so they said when we moved in),” that proved to be a boondoggle 18 months later when we moved out. In the end, the landlady was not as cool about the food plants when we left as when we first moved in. To make a long story short, she called my garden a “hodgepodge of edibles” and claimed it was going to cost her thousands of dollars to put the yard back the way it was before we moved in. I think she was annoyed that we were moving out much sooner than she had hoped (for which she has herself to blame for renting the basement apartment and our shared backyard to a couple of 19-year-olds and their rottweiler). To make a long story short, she tried and failed to rent our unit out for another year or so after our departure, but ultimately decided to sell the house instead of play landlord any longer. Out of curiosity, I snagged a sales flier to see how much they were asking for the house. To my surprise and amazement, she actually used the “hodgepodge of edibles” as a selling point, advertising that, among other things, the property featured perennial food plants and herbs (which I planted!). I’d be curious to know if that was her idea to promote the edible landscaping or if it came from the listing agent, who perhaps recognized that mature edible landscaping is an attractive and as-yet unique feature that adds value to a home. 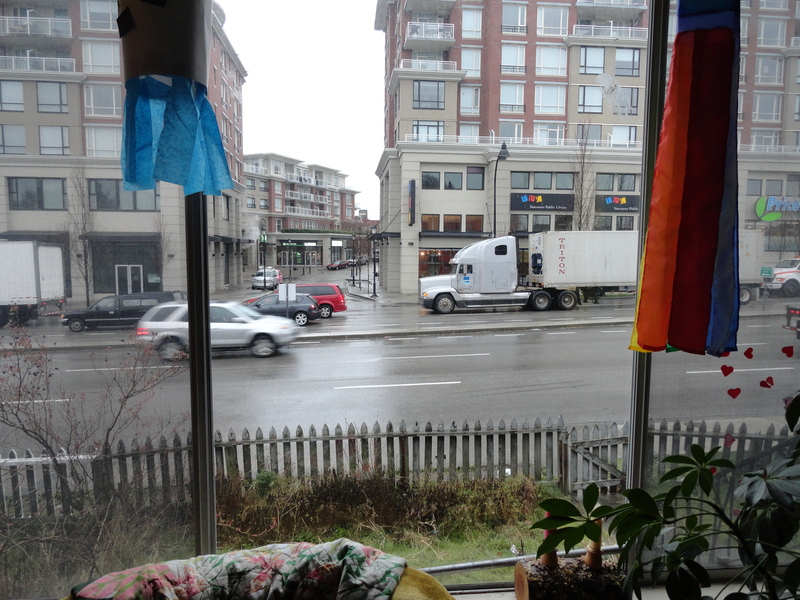 On the night of Thursday, October 24, 2013, residents of Vancouver’s Cedar Cottage neighborhood and commuters using the very busy Knight St. were shocked to find a militaristic scene unfolding between Kingsway and King Edward Aves. Apparently, police arrived shortly before 5pm to conduct a search of the residence at 3943 Knight St. 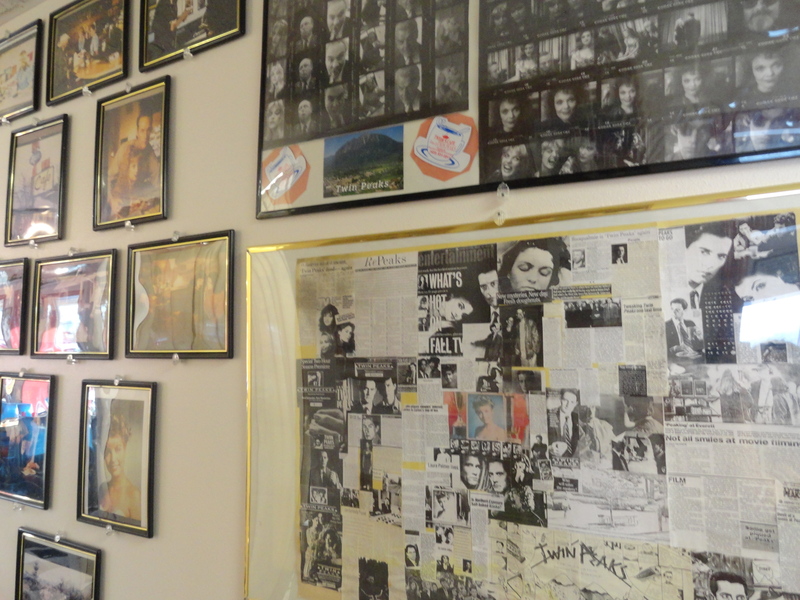 It was believed that the house contained stolen property. 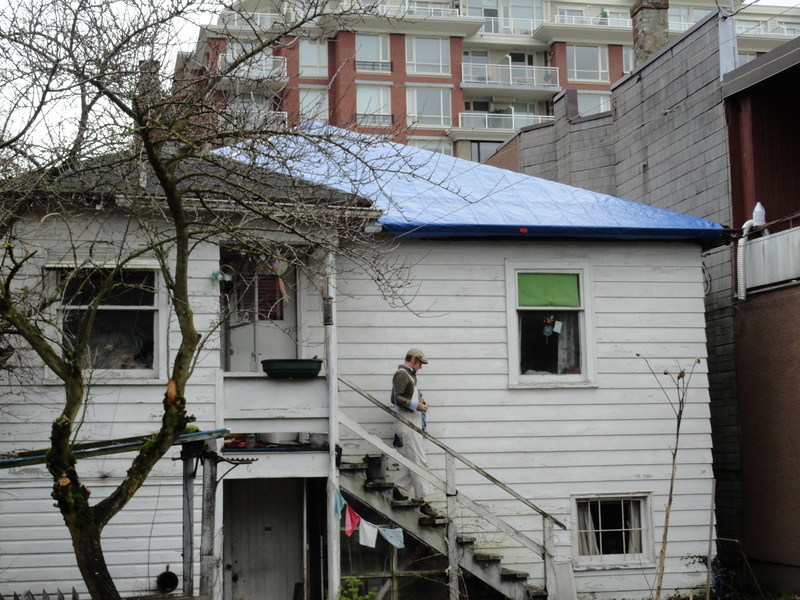 The VPD had a search warrant, but the occupants of the house refused to let police enter the premises; nor would they come out of the house. The stand-off lasted several hours and traffic on the six-lane trucking route was halted throughout rush-hour and into the evening. Pictures and videos of the incident show a turret-topped armoured ERT (Emergency Response Team) vehicle stopped in the front yard (apparently having jumped the curb and crashed through the pollution-stained white picket fence). There were dozens of police on the scene, with K-9 units. Residents of the area were startled by the detonation of several “flash bang” devices used to confuse and distract the occupants of the house. Still, they did not come out. Police eventually resorted to firing tear gas through the windows of the house in blasts that sounded like shotguns being fired. News sources say that four people, two men and two women, finally exited the house through the rear and that no one was injured. Details have not been released as to the identities of the four or what charges may be laid against them. Why am I summarizing this news story? 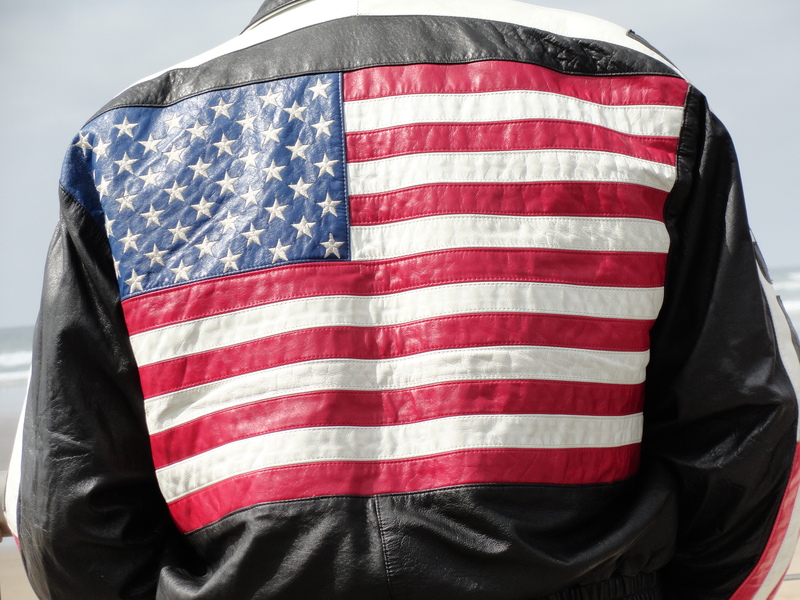 I wasn’t there; none of this is first-hand… Except that I was there. I lived in that house. My family lived in that house until just six months ago. Those pale green living room walls now coated in chemical tear gas residue–I painted them when I was eight and a half months pregnant and nesting. I laboured in the bathtub of that house, surrounded by speckled plastic faux-tiles and brought my baby boy home from the hospital to that house. And when, as an infant, he wouldn’t stop crying, my husband sat on those concrete steps–mere feet away from where the armoured vehicle pulled up) and calmed him with the whooshing sounds of freight truck traffic. The bedroom at the back of the house belonged to the children. It was in scary bad shape when we moved in three years ago, but my daughter and I repaired the cracks in the walls and painted the room a bright and cheery shade called Merry Pink. I never could get the window in the children’s room open; it had long-ago been painted shut. And now it’s boarded up because the police apparently were firing shots into the back of the house as well. The octagonal window by the front door was in the closet and provided the only natural light to the master bedroom because the other window was completely blocked by the building with the Hoang Video store, in front of which the police took cover as they fired shots into the octagonal window. The only room in that house I didn’t paint was the kitchen, because it already sported a nice splash of color when we moved in–a vintage green and blue flower wallpaper from the 60’s. The refrigerator was in the basement and we liked it that way. Also in the basement was a wood-burning stove that was very likely original to the house and, whether it was functional or not, the look of it was the definition of cozy. There was a room in the basement–we called it the “murder room” because if ever a murder was to occur in that house, that would be the room to do it in and hide the evidence. It was a windowless cold storage area with a meat hook hanging from the ceiling and an open sump in the corner that lent the air a thick, dank feel. Where once someone lovingly put up their homemade preserves and fruit wines and hung their sausages to cure, I imagine the suspects in this recent incident would have been hiding out. Some of what I know about Frank comes from clues left in the house, but much of it comes from the next door neighbor and the tenant who lived there immediately prior to us. Frank’s family moved him into an assisted-living facility around four years ago and sold the house to a real estate development company, which planned to buy up the whole block from 23rd to 24th Aves. and put up a mixed-use development of several stories. We knew all of this when we decided to rent it, but were told that it would be several years at least before they could do anything with the property. The company did buy the adjacent house, but their plans faltered on getting other owners on the block to sell. So, after we’d lived there for just one year, they sold their parcel with the two dumpy little white houses to a smaller real estate company which immediately sought development permits from the city. It was a very public residence with a lot of traffic–pedestrian as well as vehicular–so I’m sure people in the area are familiar with the development application sign in the front yard; probably less well-known is the fact that four hens moved into the backyard of the house just days before that sign went up. The backyard was a paradise compared to the front. In fact, if you’re wondering what on earth two normal, educated, family-type people were thinking to move into such a dump, it was the potential that we saw in the backyard (oh, and the fact that it was a whole house that we could afford and it was in the catchment for a great school). There were mature plum trees, a veggie patch with beautiful soil, a hand-made greenhouse that needed some TLC, and herbs gone wild amongst the weeds that had taken over in the years since Frank had gardened there. When old-timer neighbors saw me starting to bring Frank’s garden back to life, they would stop and regale me with stories of how he grew tomatoes the size of melons and how he would give away bunches of carrots and heads of lettuce to passersby. As a gardener and as a dreamer, I could see what it must have been at one time and what it could be again, if only briefly before the ultimate end. Our intention with Frank’s house was always to give it a noble and dignified end, to breathe new life into a dying house. It may not have looked like it from the front because our early efforts at keeping it litter-free were quickly thwarted by passersby who didn’t notice or care and continued to inundate us with their garbage, but the inside was comfortable and solidly-built. 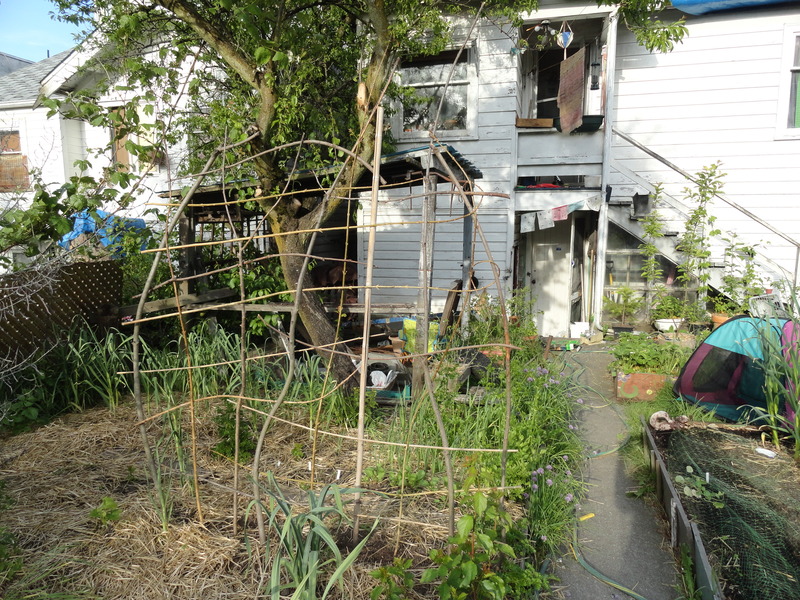 And, the backyard was an experimental permaculture playground that people frequently stopped to compliment me on. To add to Frank’s gardening legacy, we turned half the lawn into a veggie garden, planted a berry patch, built a hugelkultur bed, built a raised bed out of scraps salvaged from Frank’s own stash, turned his covered patio into a chicken enclosure, and completely rebuilt his greenhouse using materials salvaged from the dilapidated one he left behind. I regret that we didn’t stay in Frank’s house until the very end, but with kids, chickens, and a garden, it isn’t easy to find rental housing in a specific area of the city on short notice, so we felt we’d better go ahead and move if we found a great place, rather than wait to receive the official notice to vacate and have only two months to find another house as well suited to our needs as Frank’s was. Also, as a gardener, I didn’t want to plant a garden in spring just to be told we have to move in the middle of the summer and lose the harvest. So, we moved out in April. I don’t know if there were ever any other single-family houses on that stretch of Knight St. If there were, the two remaining have been the only two for a long, long time. Maybe the city re-zoned the properties such that improvements couldn’t be made to keep them as residences, preferring long-ago to upgrade the whole area to commercial or higher-density uses. Certainly, long-term ownership by old-timers content to stay put resigned these two houses to an interesting fate. I don’t know who lived in the house next to Frank’s before the current tenant, but Hank had been friends with Frank in his later years. From what we could tell, Hank hosted many characters (he introduced them as “his bums”) in a halfway-house, room-for-rent situation that was never entirely revealed to us. At one time there was actually a man living in a tent in the backyard. That’s when we put up some lattice fencing for a little privacy. Hank may have “run a tight ship,” as some who came and went claimed, but those who came and went were obviously of an unseemly bent, their awkward gaits and hunched backs belying a history of questionable recreational choices. I hesitate to pass judgement on people I never knew very well; most of the people that came and went, sketchy as they were, were friendly enough. Whatever they were into, we assumed it was small potatoes, petty crimes whose only victims were themselves. I never witnessed violence as long as I lived next-door to these people; nor did I ever see evidence of criminal activity occurring outside the home. I never saw the inside. They kept a low profile and covered every window so heavily that not a crack of light could be seen, even at night. The police had a warrant to search Frank’s house for stolen goods. I don’t doubt that there may have been stolen property in the house, but the police response seems to indicate a threat that, if real, was not reported on. The turret-topped armoured vehicle would seem to imlpy that the VPD believed the occupants of the house to be armed and dangerous. There’s a lot about this incident that doesn’t make sense. If the police had a search warrant, why didn’t they just kick the door down and enter the premises? To get the warrant, they likely had been investigating these people for some time; why did they stir up this incident during rush-hour? Why the excessively macho display of force? I, for one, will be anxiously and sadly awaiting more details of this case. I can’t even describe the feeling of seeing this militaristic scene play out on the same stage where some of the most memorable and intimate experiences of my life occurred. It’s not exactly sadness, more of a sense of tragic irony tinged with humor. Living there and fixing it up on a shoestring budget, especially the garden, was a joy. Discovering things about Frank and the neighborhood as it existed for him, was an adventure. I always knew it was destined for the bulldozer and, of course, it still is (perhaps sooner now than before), but I thought it’s demolition would go down like that of every other 1940’s East Vancouver bungalow–unnoticed by the rest of the city and perhaps celebrated by concerned neighbors. But, no! 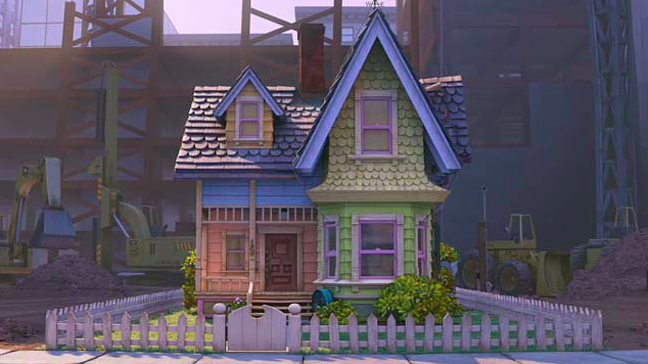 Frank’s house was not destined to go out with a whimper, but a distractingly bright bang! Following a mid-July family getaway, I set to work on a singular goal: GET CHICKENS! I’d been thinking about whether to do this for a long time. I’d read so many books on chicken keeping that I felt there was nothing left to learn except through firsthand experience. Making the decision all the more clear was the fact that I already had a covered four-post structure and weather-proof shed in my backyard that I wasn’t using. Following a major clean-up, some minor reapirs, and the addition of nest boxes and a sturdy bar for roosting, the shed would become a large coop where the birds would be safe at night. 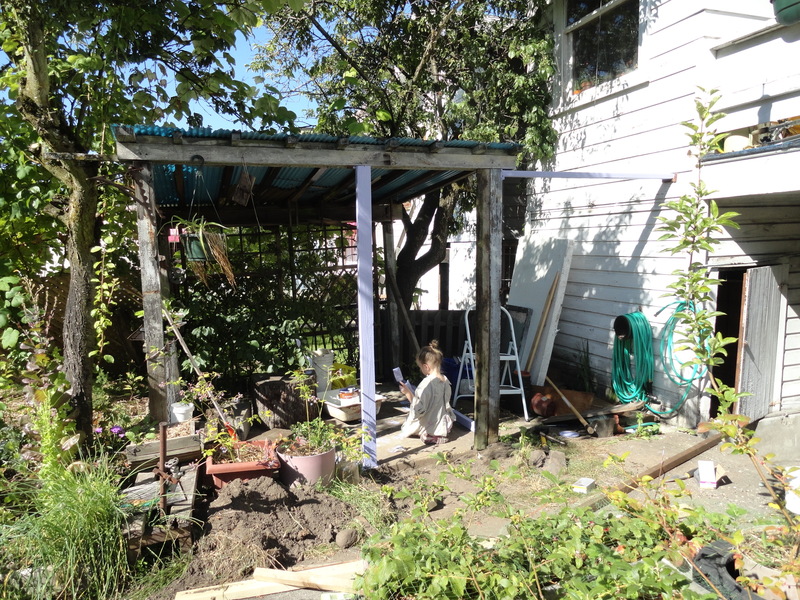 The covered structure only needed some physical support, chicken wire, and a recycled screen door to become an outdoor chicken run where the birds would have access to fresh air and sunshine. Eleanor helping paint the door frame; shed by the basement door for nighttime housing. The kitchen window looks down on the chicken run–perfect for keeping an eye out for the girls! The building process was pretty straightforward, the only major snag being the nest of angry yellowjackets in the ground beneath one of the corner posts. The vibration of my hammering drove them crazy; they would pour out of the entrance to their nest, fly all around scouting for danger, then slowly calm down and go back inside. Having to back off and wait them out was really slowing things down. I suffered two rather unpleasant stings to my hand, but soldiered on, talking sweetly to them and telling them I meant them no harm. 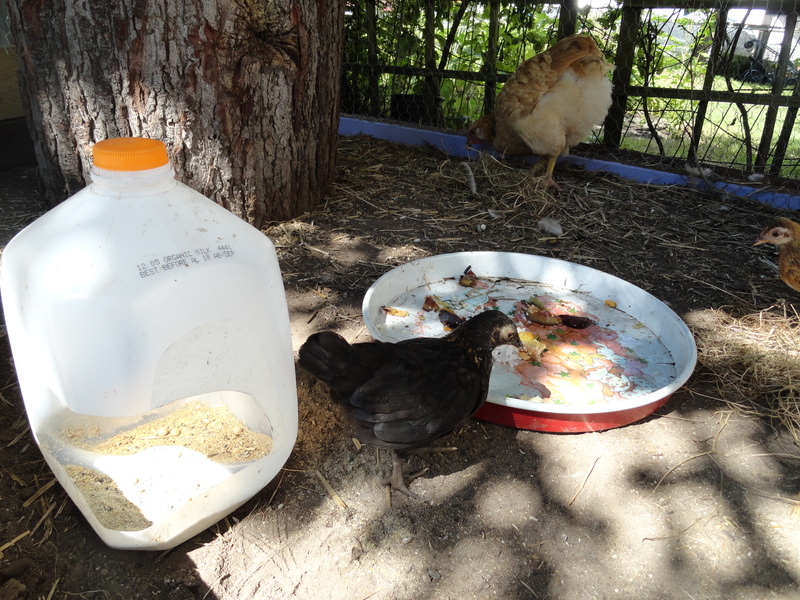 In fact, if they would just let me finish, the chickens would soon be helping to fertilize the garden, which in turn would host insects for them to live off of. Who bargains with bugs, anyway? Hubbie suited up to work over the wasp nest. 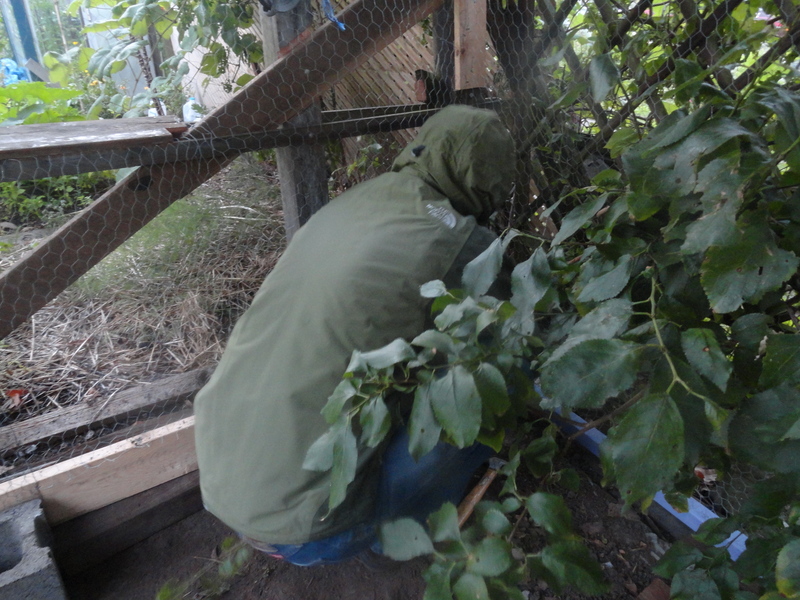 I saved the post above the wasp nest for last and then I did what any sane woman would do–I begged my dear Hubbie to get in there and nail up the chicken wire for me. He kindly obliged, putting on thick leather gloves and his winter raincoat for wasp protection. He was sweating bullets in the middle of the only “heatwave” our miserable summer could muster up and, thinking he’d be covered in angry wasps, he planned to get in there and get the job done as quickly as possible. And then–miracle of miracles!–not a single yellowjacket emerged as he drove in the first nail. Proceeding with much trepidation, he completed the job without siting a single one. The hive was gone! For the last six weeks we believed they had simply moved house. Strangely, all that remained was a large hole that looked to be the handiwork of a small animal. Then, last night I came across the fact that a skunk or raccoon will dig out a wasp nest and eat the larvae. For several nights in a row a few weeks ago Hubbie and I had seen a skunk rather cutely waddling through the unmown grass in the front yard. Mystery solved; thank you Skunk! The girls are introduced to their new home. Two standard-sized hens hopped right out; the pigeon-sized bantams had to consider it. Buying that first bag of chicken feed was like crossing a threshold, a point of no return: we were really getting chickens! We drove all the way out to Maple Ridge to pick out the four hens from a woman named Loretta. She had dozens of chickens on her 12-acre property and had, at one time, tried to keep them separated by breed so that she could raise purebred chicks. But, she greatly valued them having free range, so they tended not to breed as she wished them to. She said that she gave up after a while and settled for raising healthy, happy mixed-breed birds–not such a bad compromise, really. When it comes to dogs, I’ve always preferred a friendly mutt over a finicky purebred myself, so I totally agreed with her philosophy. We chose to take home two likely-pure Old English Game Bantams (very small, amusing, and good for children) and two standard-sized hens. 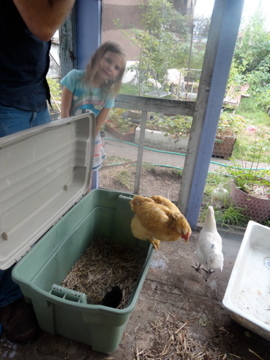 The largest hen, Goldie, is likely an Orpington x Cochin cross and the white hen with gray-green feet she said was probably an Araucana x Cochin. Dada gets a turn at the feeding trough. The Strawberry Shortcake tray from 1985 is what we serve “treats” on. It makes a nice metallic sound that the girls now recognize. Goldie and Lord Snow hang out together a good bit. 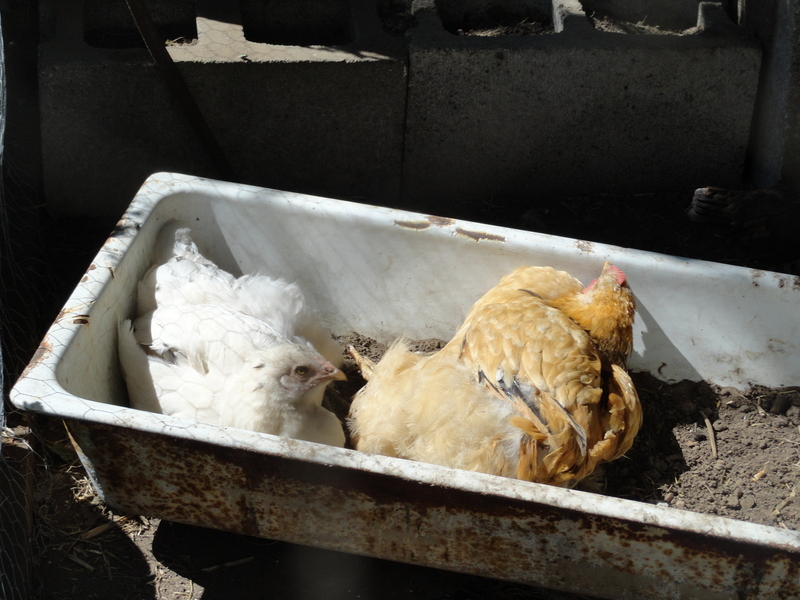 Here they’re dust-bathing in an old metal sink filled with dirt. Having hens has been fairly easy so far. Only once have we had a missing-chicken-scare! We were late eating dinner one night and the girls were antsy for their pre-bed free range time so we let them out and continued with our dinner, keeping a close eye out the window for them. When I saw the neighbor’s cat in our yard, we all ran outside to shoo him away and do a head count to be sure and… we couldn’t find Fluffy anywhere! Her beautiful coloring is called Wheaten. 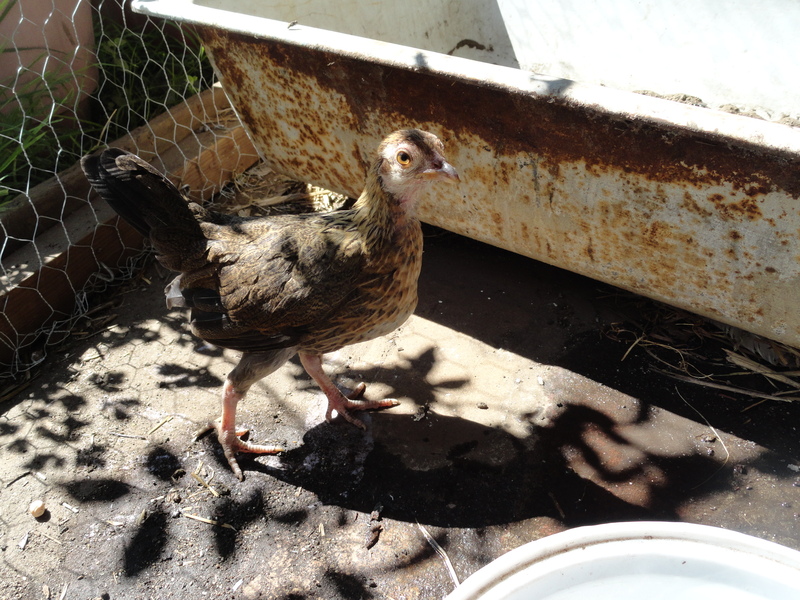 OEG Bantams are only about the size of pigeons at full maturity. Fluffy was Eleanor’s personal selection and is so sweet, Ellie was handling her and hand-feeding her the day we brought them home. We were quite sure Johnny Trouble couldn’t have gotten her that fast and there were no signs of a chicken abduction, so we just waited for the sunlight to fade that magical amount that would trigger the chickens’ head-for-home instinct. For the remainder of our meal we spoke very seriously to Eleanor about the slim chances of this bird returning; we, perhaps a bit insensitively, tried to console her with the reminder that these chickens were to be food-producing animals, not pets, so we shouldn’t be too sentimental about it. About half an hour later, quite unbelievably, Fluffy came walking around the corner of the house just as the other birds were starting to make their way toward the coop door. She had been hiding from the cat, we supposed. She and Dada did a reunion dance and that was that; they went in to roost for the night. It turns out that chickens are the ultimate creatures of habit and, for this reason, it isn’t hard at all to get them in and out. Since our coop is not contained within or directly attached to the outdoor run but is actually separated by about five feet, I was worried in the beginning that it would be difficult to herd them into the run in the morning without setting up some kind of “chicken chute” to prevent them escaping. By now, though, we’ve settled into a timely routine that works for us. The hens now get some free range time in the morning when they first come out of the coop and in the evening before they go back in to roost for the night. Now, we’re just waiting for eggs. Not wanting to raise chicks our first time, we started with 4-5 month old pullets, so they should be getting near old enough to lay by now. However, egg production is influenced by hormones triggered by daylight and since the days are getting shorter and shorter, it could be spring before we have consistently good egg production, even if they started laying now. Supplemental lighting for a few hours a day may be something to try during the winter months. For now, we’re just enjoying watching and being with our first feathered friends! I thought last year’s cool, wet spring leading to a late start to a short summer was a bummer, but this year has been even worse, especially for my garden. 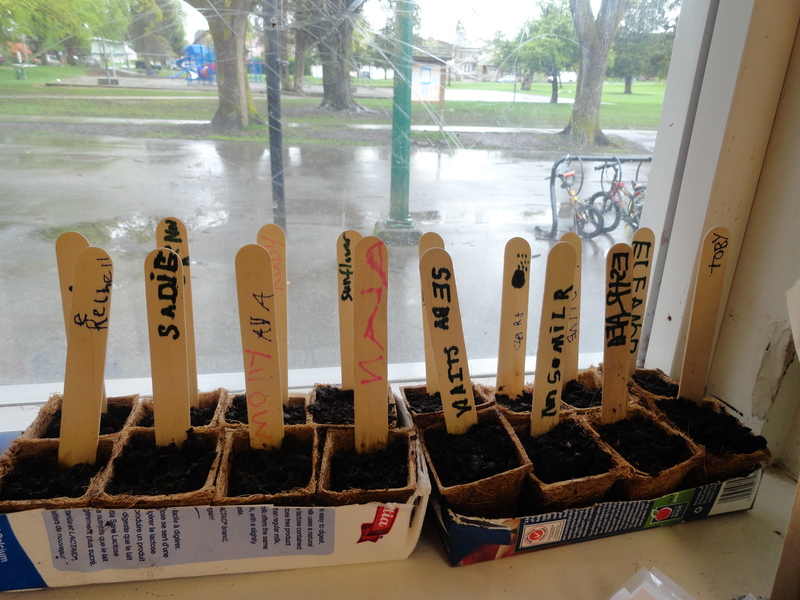 I have had to reseed many things that are usually very easy to grow–lettuces, arugula, brassicas, radishes even! I mulched too early, causing an explosion in the number of slugs in the garden and they’ve decimated everything. On top of that, I’ve lost tray after tray of indoor starts when I put them into the greenhouse to harden off and apparently rats from the junkyard next door found them. 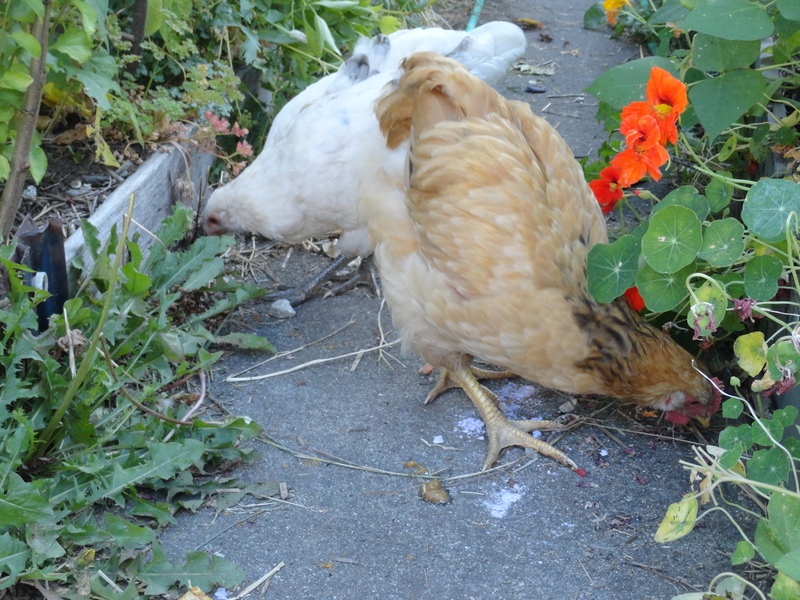 I’m not surprised they ate the nutritious broccoli and collard starts, but they helped themselves to Ellie’s wildflowers too! On the bright side, the garlic is going strong; we’re eating the scapes now. The strawberries are producing prolifically; unfortunately, the lack of sun has resulted in quite tart fruit. At least when it comes to raspberries and tayberries, tartness isn’t a bad thing and these are now starting to bear fruit as well. I got my corn transplants in the ground much later than I wanted; now I’m concerned that the heat of summer won’t last long enough for the corn to mature. The pole beans, which ought to be really straightforward to grow, are getting off to a really slow start due to slug damage. I have, since realizing the problem, removed the straw mulch from the newly planted areas, but it hasn’t seemed to help much. Likewise, beer bait traps haven’t curbed the onslaught. I just keep hoping for sun and warmth (show me some global warming!) and checking the long-range forecast. Sun always seems to be a few days away, but it doesn’t materialize and I’m starting to lose faith in meteorology. Weather like this has me wishing for a heat wave like they’re having in Atlanta right now. Ahhh… What I wouldn’t give to bask in 100-degree heat! I’d like to think the pitiful state of my home garden is just an indication that I’m spending too much time in other gardens, all of which have been way more successful. Last weekend we wrapped up the Landed Learning year at UBC Farm with a volunteer appreciation dinner and I said goodbye to the beautiful plot my kids had tended all spring. Every time I’m at the Mt. Pleasant Family Centre, I stop in to see the community garden plot I helped start there, and it’s growing beautifully as well. Even the garden plots at the Charles Dickens Annex Children’s Garden, to which we added almost no compost and can hardly stay on top of the weeding that needs to be done, are off to a great, albeit late, start. There, the lettuces and radishes were well timed for me to harvest a huge bowl of salad for the kindergarten kids to share (since they’re the ones that planted it) with their friends and teachers on the last day of school. The only high point for me this early in the summer has been the start of my new job at the Vancouver Homesteader’s Emporium. The store hasn’t opened yet, but we made an appearance at the Main Street Car Free Festival to let people know what we’re all about and that we’ll be opening soon. Basically, we’re a store specializing in all manner of urban homesteading materials–from everything you need to keep bees and chickens in the city to any supplies you need for canning, fermenting, baking, and making your own cheese and soaps. And, don’t worry if you don’t know how to do all those things yet; we’ll be offering workshops to get you started! I’m super excited about the opening of the store because it’s a chance for me to learn more as well as share what I already know. Also, it’s great to be involved in the store from the beginning. I went in on Friday to help unpack inventory and clean up the construction mess. The space is looking awesome and I see so much potential for this store as a viable, profitable business! We’re located at 649 E. Hastings St. in Vancouver, right across from Dan’s Homebrewing Supply store, so come check us out. We’re aiming for an auspicious opening date of Friday, July 13th. I’ve been saying for the last month and a half that perhaps I’ve over-extended myself with all the gardens I’ve been involved with lately, but they’re all so dear to me, that I can’t possibly think about not participating in one of them. Closest to home and to my heart is my own backyard garden, where despite the slugs eating all the seeds I’ve tried to start outdoors, I’ve enjoyed lots of greenhouse-grown spinach and lettuce salads, the asparagus has finally sprung forth, the apples are the size of quarters, the flowering kale is 7 feet tall, and the sage is ablaze with purple flowers. The Family Center where I take my son for a children’s play group finally received a plot in the community garden next-door and, knowing that I am a gardener and student of permaculture, the newly-formed gardening group asked me to come and help out with garden planning and seed starting. It was a fun morning and I think I even blew a few minds with my explanation of “weeds” as helpers and indicator species. For example, when asked what to do about dandelions in the garden, I pointed out that, not only are all parts of the plant useful in a myriad of ways as food or medicine, but that the plant itself plays a vital role in rehabilitating worn and compacted soil by reaching deep down with its thick tap root and drawing up water and nutrients that are out of reach of other plants. After reflecting on this, most members of the gardening group were “wowed” by this new perspective on a plant which has undeservedly earned the ire of gardeners all over. 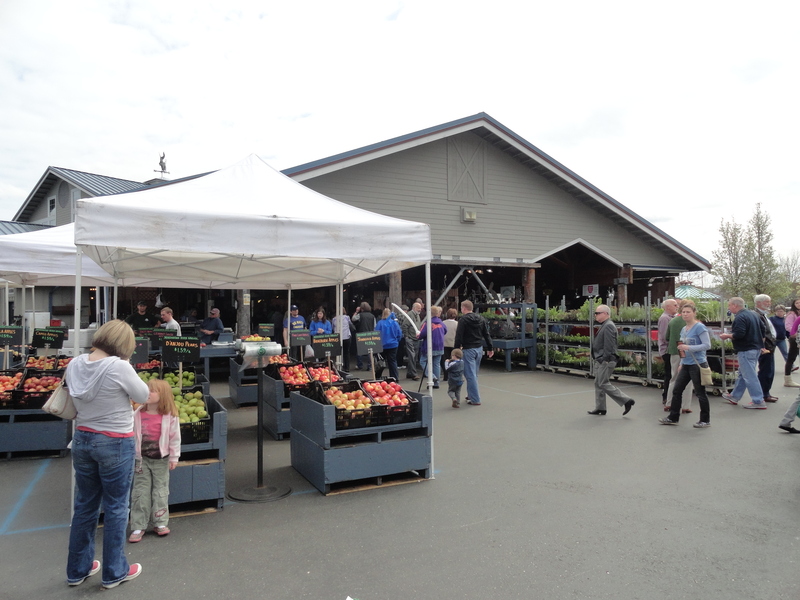 Also, I was involved in helping plan the 10-year Reunion of the Intergenerational Landed Learning Learning Project at UBC Farm. 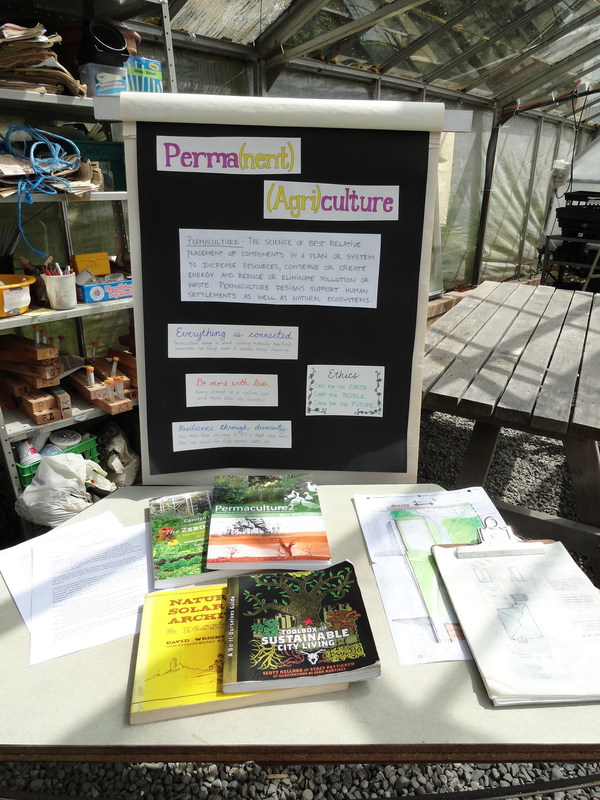 This is the third year that I’ve been involved in the project, so I volunteered to run an activity booth to share with others my passion for permaculture. I worked very hard over the last couple months working on a card game aimed at educating people about the myriad connections between elements of natural and man-made landscapes. I created a deck of fifty-two cards (and counting…), each one featuring a different element (for example: chicken, human, bathtub, rain) with their inputs and yields listed on the back. 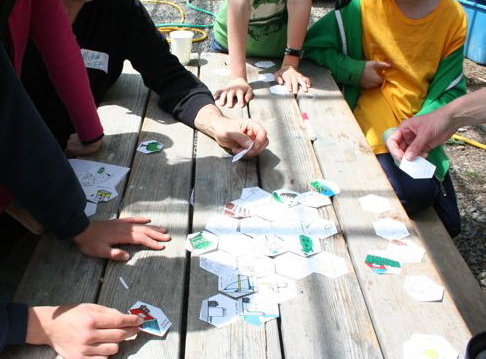 As with dominoes, game play involves laying one of your cards down next to one that’s already been played, but it has to link up–that is, where a connection of resource use or energy flow can be made, or, where the output of one card serves the needs of the other. It’s more of an educational toy than a winner-takes-all game, but I think it’s a fun way to illustrate the interconnectedness of man-made systems with those of the natural world. How well the point came across, I don’t really know, but I do know that people had fun thinking outside the box. More than one participant caught on to the fact that all the excess heat and steam produced by taking a shower or using a clothes dryer could, with good design, be directed for secondary use to heat a greenhouse, for example, instead of simply being released into the atmosphere. This is exactly what I wanted people to get out of the game: an understanding that thinking differently about how we design our homes and lay out our neighborhoods and cities, we can create landscapes that both serve the needs of humans and reduce energy and resource consumption. I have learned so much myself from my involvement with Landed Learning, but I’ve also gained an incredible sense of confidence and pleasure in my role as a mentor and educator, which brings me to my third garden engagement, the Children’s Garden at Charles Dickens Annex. My daughter started kindergarten this year at this wonderful little neighborhood school. It’s K-3 and very small, which we like a lot, but the garden, which was established over 30 years ago, has experienced an unfortunately high variability in maintenance and parent involvement over the years. I’d like to change that by tailoring some of what I’ve learned through my involvement with the Landed Learning Project to working with the younger kids of Charles Dickens Annex. This year, we have a group of at least 6 parents dedicated to cleaning up the garden and getting the kids from all six classes involved in planting the garden. At the beginning of the spring, the school owned no seeds, tools, or gloves to even get started in the garden, so one of the parent volunteers who writes for a living submitted a very well-written and thoughtful application for a Small Neighborhoods Grant that will supply the funds for these items as well as pay for someone from the Environmental Youth Alliance to visit our school and speak with the kids about bees and the importance of their role as pollinators. We’ve had two garden clean-up parties so far, at which we transplanted the blueberry bushes, and prepared the raised beds for planting by weeding and adding compost to them. There are two mature apple trees in the back of the garden from which the children harvested fruit in the fall to make apple pie for their Thanksgiving celebration lunch. The trees, however, were quite overgrown, making it difficult for people, even little people, to move around them. I made it my project to prune these trees during the garden clean-ups and, although it was a bit late in the year to prune fruit trees and we did lose a lot of the flowers, the trees are now producing a lot of fruit and look much better. I think the increased air flow and light that will penetrate through the branches will help keep these trees healthy for a long time to come. We’ve also submitted a grant application to the Vancouver Greenest City Fund to supply the school with funds for some additional projects. For starters, we need to build a new composting system. At this point, there is no flow to the compost system; new organic material is simply added willy-nilly to one of four separate black compost bins and the result is a big mess. Composting is an important part of organic gardening, as it completes the cycle of nutrient flow, returning to the soil what has been removed. But, if we’re going to educate kids and participating parents, we need to do it properly so that it results in a nutrient-rich compost that is safe and effective, not smelly and harboring potentially dangerous pathogens. So, we’re asking for materials to build a single three-bin composting system with clearly-labelled compartments for adding new material, turning in-process material, and completed compost. We’ll add labels with instructions on what can and cannot be composted in a small backyard system. Additionally, our grant application requests funds for rebuilding the raised garden beds, as some of them are starting to rot and they’re all quite low to the ground, which makes them inaccessible to students that use wheelchairs and walkers. The paths through the garden are also prohibitively narrow for children who use mobility devices so it would be nice to redesign the layout of the beds to accommodate those students. 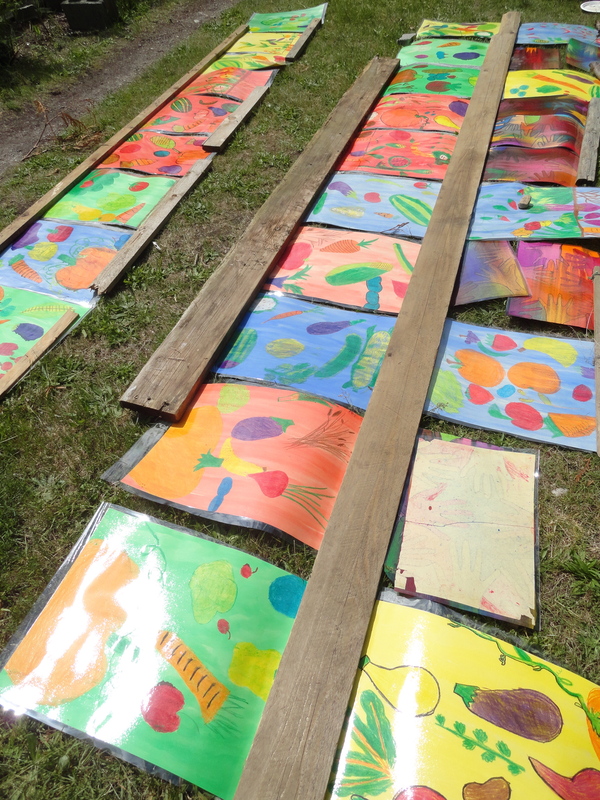 Another project I’ve been brainstorming for the Annex is the creation of a food forest play space on the back side of the school. The idea came to me when I observed my daughter and her friends playing under the overgrown bushes. They had formed a club called the “Nature Nuts” and were hiding out in their “clubhouse.” It brought to mind a book I read a while back: Last Child in the Woods: Saving Our Children From Nature Deficit-Disorder, in which author Richard Louv argues that urban children suffer from a lack of natural spaces in which to play freely and imaginatively. Looking around the grounds of my daughter’s school, I notice exactly what Louv describes: fancy modern (and no doubt expensive) play equipment that offers a limited array of ways to play and a large grassy field ringed by some nice shade trees. There’s no denying that the latter affords ample space for running around, playing sports, and having picnics, and the former aids children’s development of skills and coordination, but neither offers much for the imagination. By contrast, natural spaces with varied topographies, trees for climbing and swinging from, overgrown bushes to hide in and around–these allow children to escape to other worlds and play anything they want. I realize many parents feel that it is unsafe for a child to be out of sight in a public place because there are bad people in the world and tragic things have happened to children in places where they should have been safe, like on school grounds. That being said, children shouldn’t be denied a connection to nature because their parents have been fed a dose of media-hyped paranoia about child predators. And maybe, just maybe, access to nature for all members of society can have a humanizing effect and engender more sensitivity and compassion in all people. Family Road Trip: 1200 Km. in 48 Hours! Leaving Friday night around our usual dinner time, we thought we’d eat on the road and our ten-month-old baby would just zonk out the rest of the way. That night, he proved to be a rather unsettled car-sleeper, waking and crying often, us wondering if we were out of our minds to be attempting a whirlwind road trip with two kids. Our six-year-old daughter pulled out a loose tooth about five minutes into the drive and had nothing for the blood save Mommy’s scarf. Finally, with the kids both sleeping in the car, Mom and Dad had some quiet time on the road in which to discuss the wisdom of Mom committing to an unpaid (and therefore technically illegal, I’ve learned) farm internship for which she had interviewed that afternoon. We pulled into Tumwater, WA (outside Olympia) well after midnight and, as if there wasn’t enough to do to before bed, Mom had to will herself to stay up long enough to play Tooth Fairy (good thing our rummaging for American cash before leaving the house had resulted in exactly $1 bill). The Interstate was great for making good time to this point; now we hit the back roads. Saturday morning we drove west toward Aberdeen. 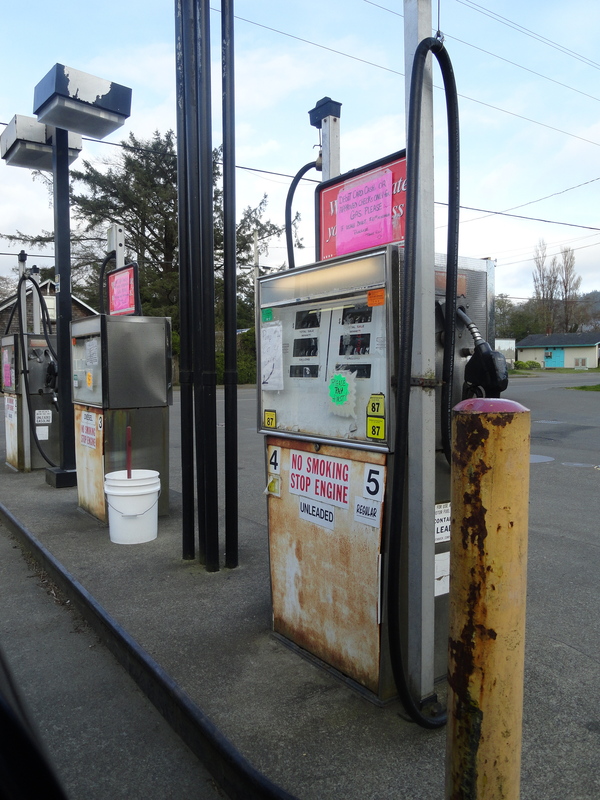 To Raymond and South Bend–oyster capital of the world or something–and south to Astoria, OR, a beautifully run down town I could totally live in except that it’s just about too hilly for biking. Drove for a bit admiring the old houses and downtown buildings. Stopped at a coffeehouse in a restored old building under the bridge that had originally been a Finnish meat shop. We needed wi-fi and we needed to ask a local where to get a memory card for our camera (can’t leave home without leaving something important behind). 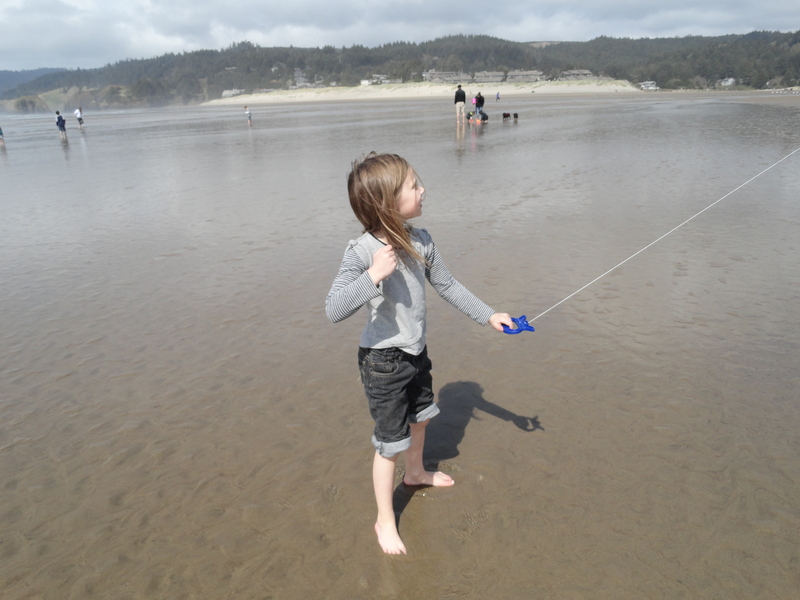 Found a Walgreen’s, then headed to Cannon Beach, where Ellie got a kite, purchased from Mr. Cherry Garcia himself at the Kite Factory. Found a playground. Flew the Mermaid kite way up high while Henry crawled in the sand looking for tasty morsels to stick in his mouth. 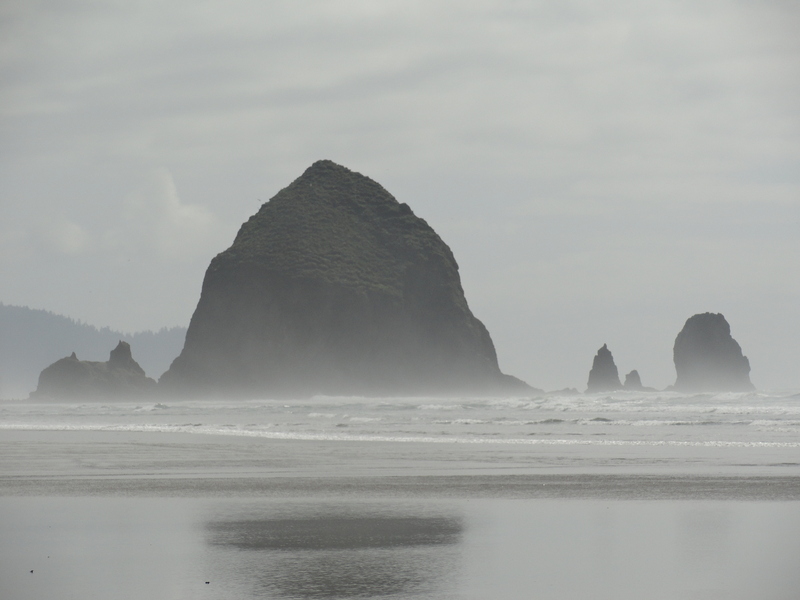 Puzzled over the scene at the end of The Goonies where the ship comes out from behind Haystack Rock, which appears to be to the right, but in reality is to the left. Ate fish ‘n chips. Got salmon jerky. 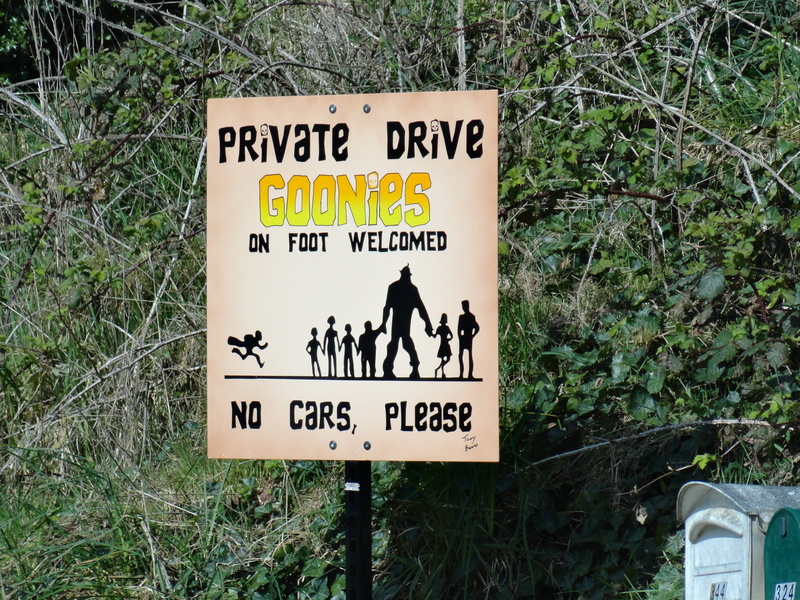 Back in Astoria, we found the Goonies House overlooking the Columbia River where sea lions barked loudly. Both kids asleep in the car, we drove the twisty, mountain roads once again looking at all the old houses, some beautifully restored to their Victorian colors, most not, most sagging and peeling. Found a park with a merry-go-round, Mom insisting that Ellie get to experience the thrill of an authentic, high-speed merry-go-round like I haven’t seen since I was a kid. The prevalence of blond hair on the playground gives away the town’s Scandinavian roots. The Lewis and Clark expedition was stuck at Dismal Nitch (back on the WA side of the Columbia) for a week; not us–we stretched our legs, looked at the map, and decided, despite the late hour, to forge on to Long Beach, which was the original destination of our trip. 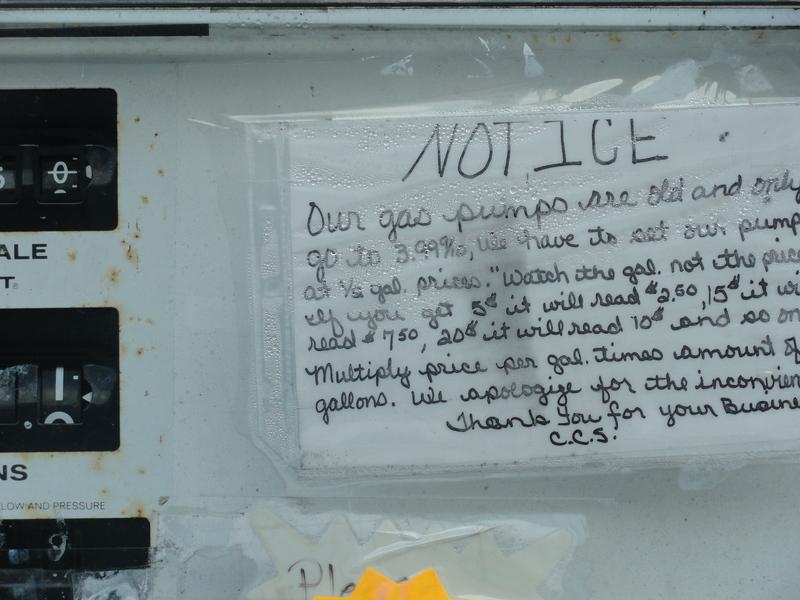 On the way, we got gas at a country bait store where the pumps were so old the price of gas couldn’t be set higher than $3.99, so they priced it by the half-gallon. Mermaid, the kite, came with us as we strolled the boardwalk and saw an immature grey whale skeleton, “rearticulated.” Henry learned to fall easily asleep in the car by this point. Missed Marsh’s Free Museum, which Dad remembered going to as a kid and being freaked out by “Jake the Alligator Man” (maybe another time…). Treated the kids to McDonald’s PlayPlace in Raymond since we’d never do it here. Got a Big Mac. Gross. …got marjoram, peppermint, and bay laurel tree, cumin raw milk cheese (de-lish! 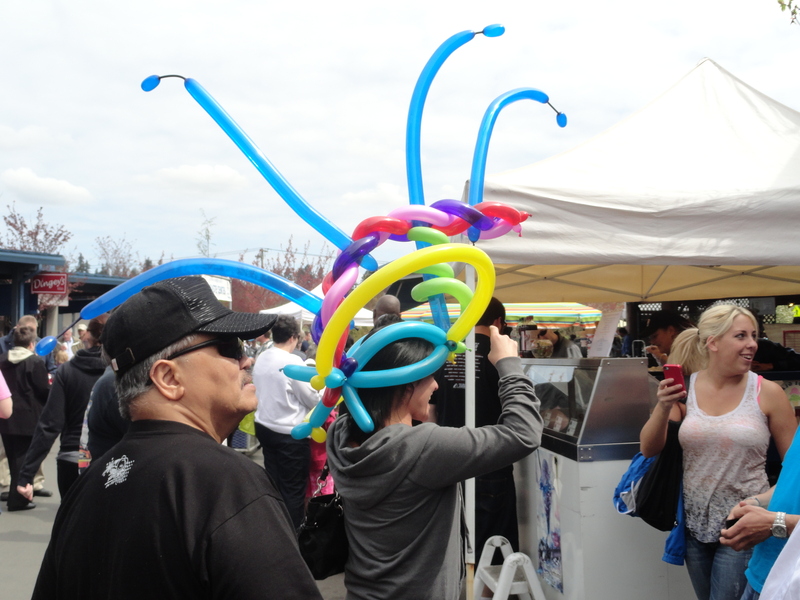 ), pink poodle balloon animal, and Mexican food for lunch at Farmer’s Market. 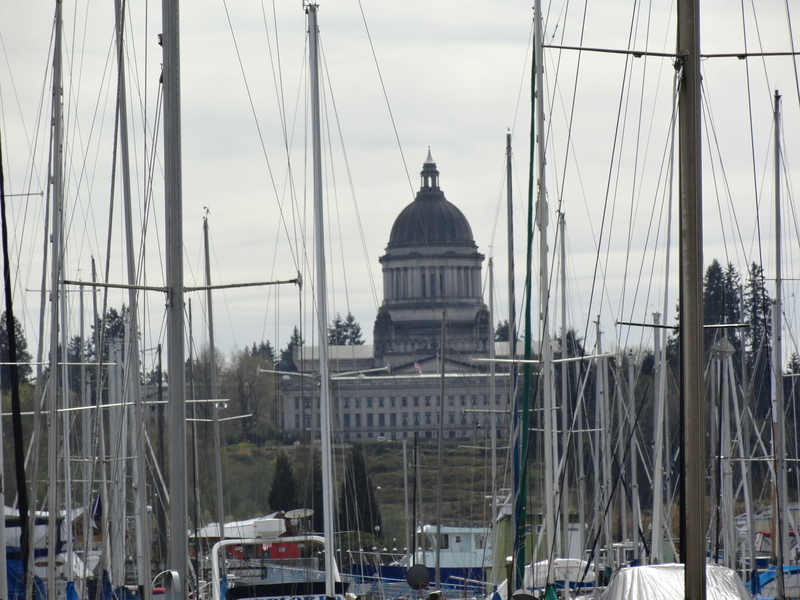 Saw port, state capitol view, decided Olympia waterfront leaves much to be desired as far as sight-seeing goes. Henry had first ice cream. 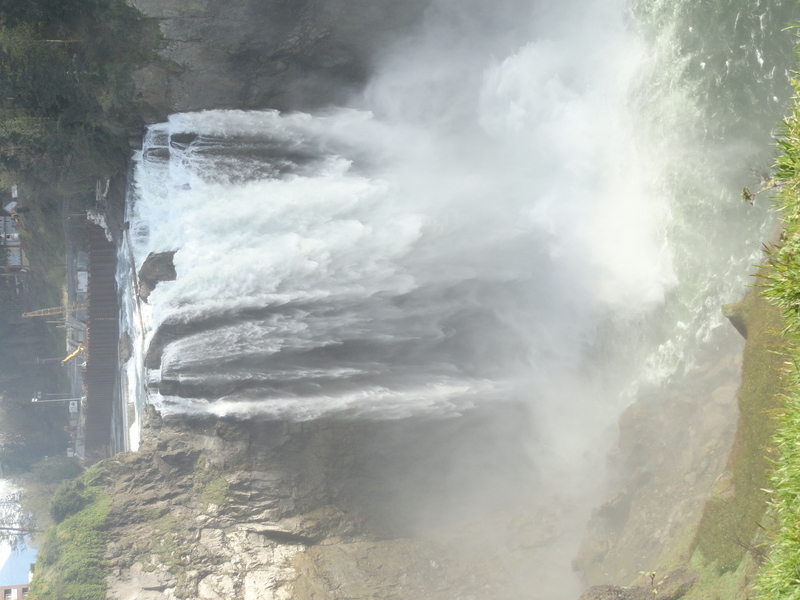 To Snoqualmie Falls, which appears in the intro to the early ’90’s show Twin Peaks; the hiking trail was closed. 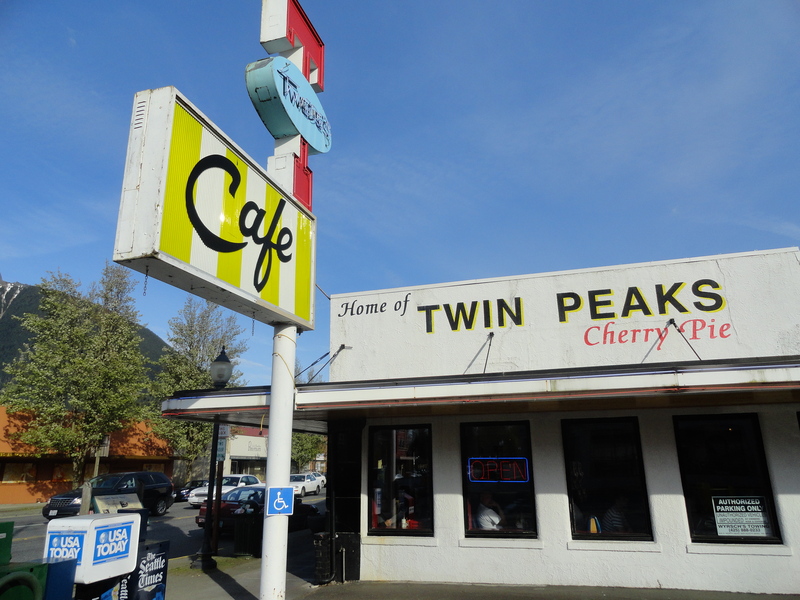 After studying the map there, Mom convinced Dad we should drive to Meadowbrook Farm Preserve, which we never found, but serendipitously came across Twede’s Cafe (exterior also used in Twin Peaks), which hosted a nice fan wall, and a motel that was also filmed for Twin Peaks. Drove by Railway Museum, Dad realizing miles down the road that the old railroad cars had also made an appearance in the show… and that spontaneity can be fun. Hit the road for Seattle, then north for Vancouver. Little hold-up at the Border, but no problems bringing my undeclared plants into Canada. Got home so late, I should have just gone straight to bed, but checked email instead, and was surprised to find (because I hadn’t expected him to be so prompt about it) an offer for a paying position at a really cool new store, The Homesteader’s Emporium. So much for that unpaid internship! I went to bed that night absolutely elated from the thrill of the trip followed by the excitement of this great news! What a weekend! Until this past year, the only winter gardening I’d done was inadvertent, like a few years back when I left a chard plant to wither with the first frost and, much to my surprise, spring warmth brought a fresh flourishing of young leaves. Hoping it wasn’t just luck that first time, I decided last summer to plant some cold-tolerant veggies to see if they would over-winter and produce an early spring harvest. The verdict? 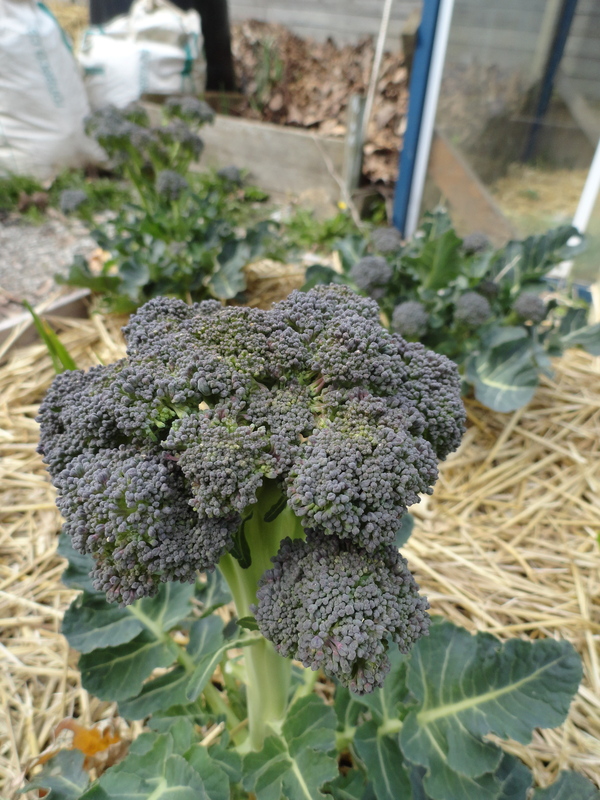 Not surprisingly since they’re all in the notoriously hardy brassica family, the broccoli, cabbage, and kale withstood cold temperatures and frost the best. Starting them a few weeks earlier in summer would mean bigger plants going into the winter when growth all but ceases and, therefore, bigger plants at the time of spring flowering. Maybe steaming it in the microwave wasn't the most dignified treatment of this broccoli that we waited eight months to eat, but it was delicious nonetheless. The chard, arugula, and spinach, despite having more tender leaves, were also able to shrug off a light frost; some leaves were lost when temperatures dipped more than a couple degrees below zero. Arugula grows particularly well in cold temperatures, forming beautifully compact plants that we ate from for months before they showed any sign of bolting, which was around January. Soon we’ll be having garden-fresh salads with arugula and kale blossoms on top! My big regret is that I’m not getting to enjoy the purple sprouting broccoli that I planted last year. Not realizing that it is a biennial plant, I thought it wasn’t producing flowers last year because of a nutritional imbalance (too much nitrogen?) and since all three plants had contracted a raging case of aphids that I didn’t want spreading around the garden, I decided to remove them. I soon learned the error in my thinking and now that I see purple broccoli sprouting in other people’s gardens, I am kicking myself for being so impatient. Despite the news of the impending sale of our house to a commercial property development company, the glorious springtime weather has us out in the garden almost daily. 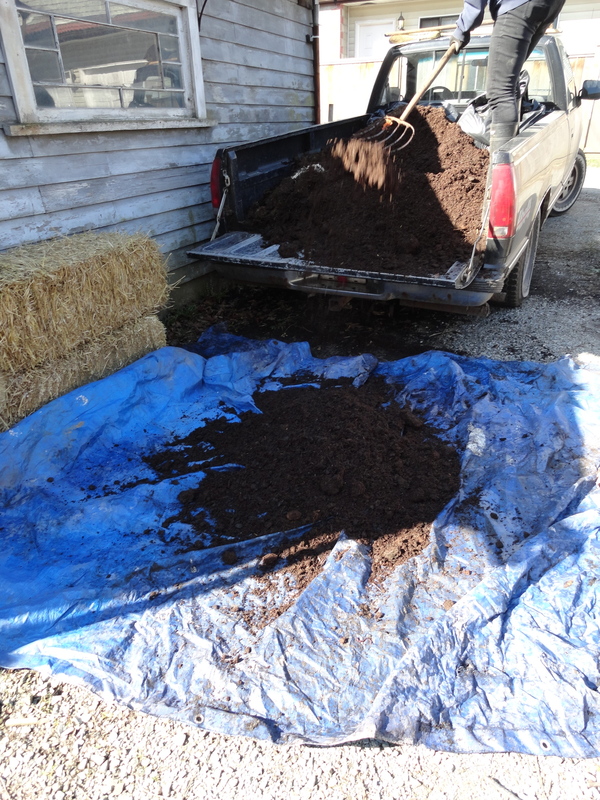 In the last few days, I have added aged manure to the garden beds and greenhouse. Every bed has received a nice layer of straw to protect from spring rains and drying winds. The apple trees, blueberries, and strawberries (all in containers so they can go with us when we have to move) were top-dressed with manure. An afternoon of sun showers and hail storms followed a morning of potato planting. The night before last, I noticed a full moon, big and low in the sky. I wanted to get potatoes in the ground to test Maw-Maw’s theory about planting root crops with the waning moon. For above-ground crops, Maw-Maw only plants when the moon is in the sign of Cancer. She says that’s what her father used to do. He wouldn’t have called himself a biodynamic farmer or anything so new-agey; he was the heir to a long tradition of farming and he knew when to plant by simply looking at the stars in the night sky. Without knowing the word, I bet my great-grandfather would’ve grasped the concept of hugelkultur. My hugel bed is coming along nicely now. So far, I’ve transplanted the lupins I started inside to the hugel bed, as well as some oregano and thyme. On one side I sowed quinoa and the millet seeds I saved last year, in hopes that these grass-like plants will grow quickly and spread their roots to hold the mound in place. 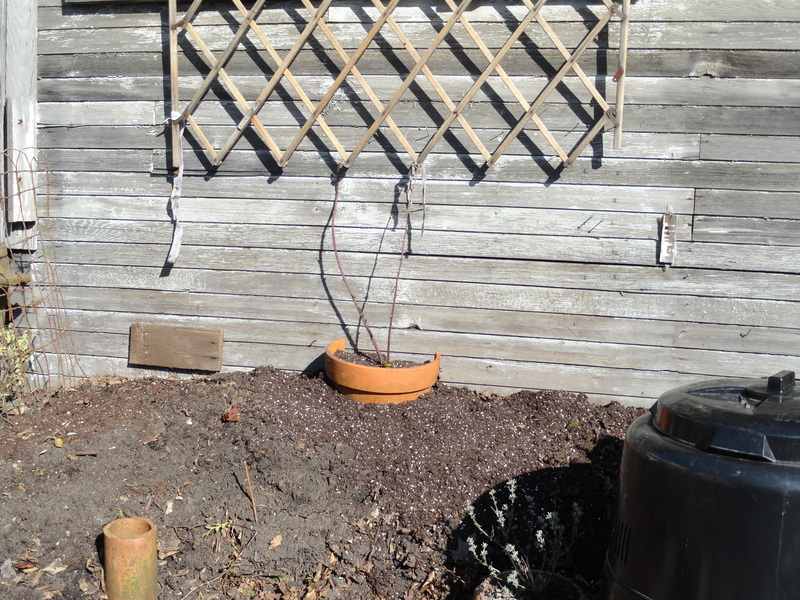 Later, I’ll plant some sprawling tomatoes on the mound, which will benefit from the warmth reflected off the garage wall. An old baby gate will serve as a trellis for the tayberry. The wire fencing, visible on the left, extends 8-10 ft. out of the picture and will provide support for shelling peas as well as a little privacy from the busy back lane. 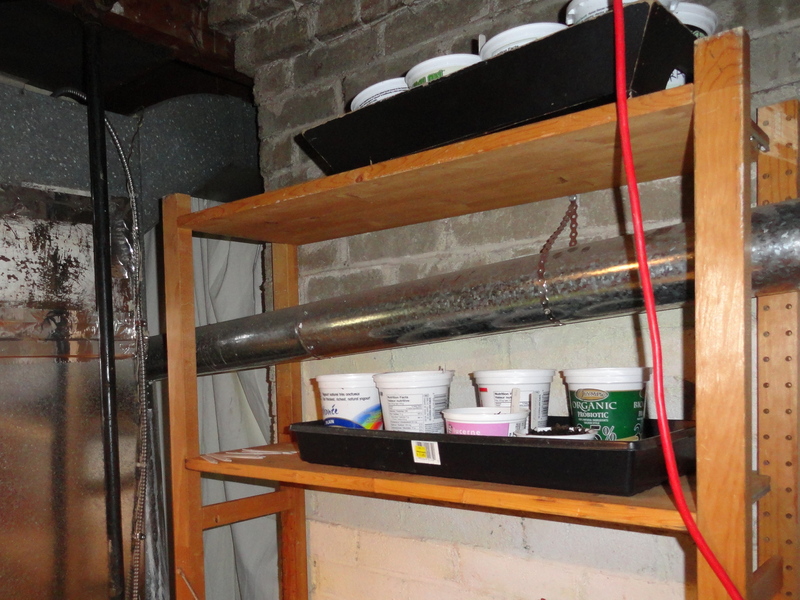 Of course, the garden really begins in the basement, where last year we set up 4 ft. tube fluorescent lights for starting seeds on some built-in shelves. The part of the basement where the seedlings live stays around 60 degrees F., which is fine for starting most seeds of flowers, herbs, lettuces, and brassicas (broccoli family). But, heat-loving plants like tomatoes, peppers, and eggplant germinate best when the temperature is closer to 70 degrees. In the past, I have germinated these types of seeds by precariously balancing their trays on the fluorescent light fixtures themselves to make use of any wasted heat. This year, I have moved and rebuilt a shelving unit to make use of the heat given off by the gas furnace. The exhaust pipe from the furnace blasts these shelves with wasted heat every time the heater comes on, keeping this area a few degrees warmer than the rest of the room. My post about life in a dying house could not have been more timely. 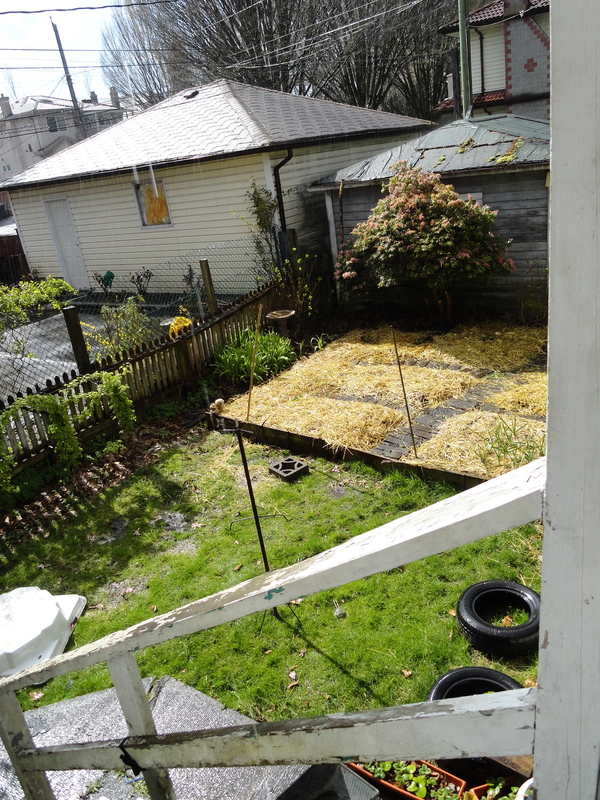 Soon after writing that piece, in which I mused on the implications of Vancouver’s rapid gentrification and the supreme irony of practicing permaculture on a site slated for commercial redevelopment, I discovered that our property has been sold. Did my landlord inform me of this? No, I had to do some sleuthing to tease out the truth. Some strange things had occurred recently that started to add up to a major tip-off. First, a few months back, I saw from my kitchen window two men, looking very white-collar, stopped in the backlane; they seemed to be discussing and photographing something in my direction. I went to get my shoes so I could run out and ask them what they were doing, but when I got outside, they were gone. I told myself it was the condo building above that they were pointing out, because I didn’t want to think otherwise. Not long after that, I saw a two-man survey team working in the back lane. Once again, by the time I got back there, they were walking off around the corner of the far end of the block. From back inside, I saw them get into a City of Vancouver Engineering Services van, so I told myself they couldn’t have anything to do with a private property deal. I really wanted to ignore the red flags, because I love this house and I want to live in it as long as possible, even though I know (and have known since signing the lease) that our time here would be limited. I got really suspicious when, for a third time, I looked out my kitchen window and saw a strange man walking through my garden. When I asked what he was doing and if he was sent by the company that owns the house, he explained that he was from a third-party “environmental company” checking for a buried heating oil tank. He was evasive about who sent him but, when pressed for information about the property development process, he indicated that oil tank removal is a prerequisite for obtaining financing. I assumed this meant that the current owners intended to finally do something with the property. The following day, I asked the neighbor if he knew what was going on, since our houses are both owned by the same company. The neighbor said that one of his bums said they saw an ad for our two houses for sale on-line. I immediately googled it and, sure enough, a realtor’s website came up with a photo of both houses under the banner “Just Sold!” The price tag? $1,700,000! The current landlord says he was going to tell us as soon as the sale went through. 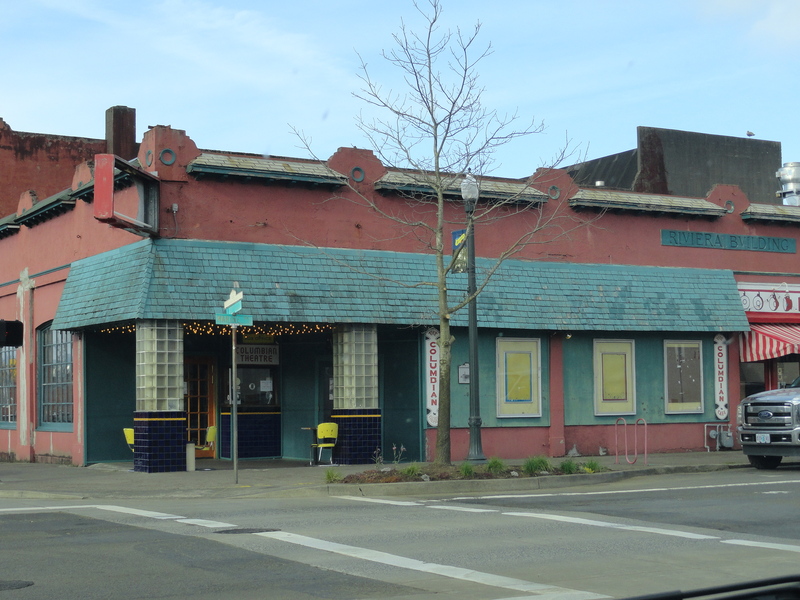 Now I realize the inspection required for financing was not being sought by the current owners for building, it was part of deal to sell the property altogether. 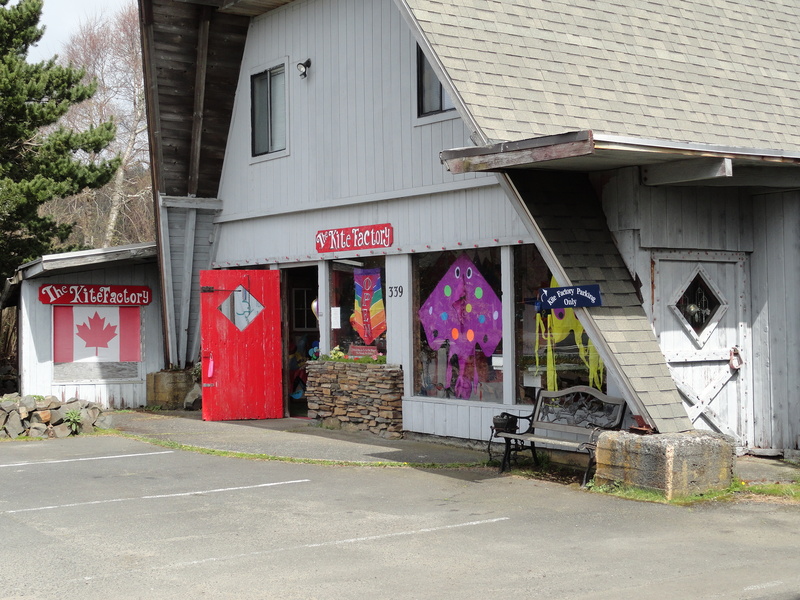 We’ve been told that, even if the new owners want to move right away to demolish and rebuild, it takes at least a year for permits to go through and plans to be approved by the city. We’ll see what they say in May; that’s when the deal is supposed to close. In the meantime, I’ll garden like there is a tomorrow. I placed an order for manure and straw bales to be delivered just days before I discovered that our house was sold. No time to ponder the loss: I'm going to get the most out of this year's garden since it may be the last. 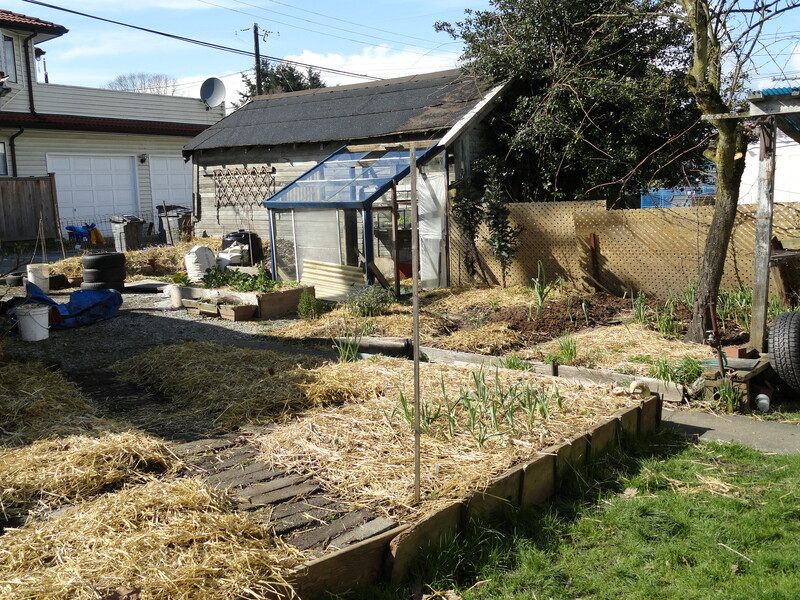 I added a healthy dose of composted manure to the garden beds and a layer of fresh straw to protect the soil surface from compacting and drying out. Already, I've sown seeds for salad greens, carrots, radishes, fennel, spinach, collards, and kale.